Milla Jovovich born December 17, 1975 is a Ukrainian-born American model, actress, musician, and fashion designer. During her career, she has appeared in a number of science fiction and action-themed films, earning her the title “The Reigning Queen” of “Sci-Fi” on Movies Models and Music Magazine. Jovovich began modeling when Herb Ritts photographed her for the cover of the Italian magazine Lei (“She”) in 1987.Richard Avedon then featured her in Revlon’s “Most Unforgettable Women in the World” advertisements and she also appeared in campaigns for L’Oréal cosmetics, Banana Republic, Christian Dior, Donna Karan, and Versace. In 1988, she made her first professional acting appearance in the television film The Night Train to Kathmandu and, later that year, she appeared in her first feature film, Two Moon Junction. After a few more lower-profile film and television appearances, such as in the Married with Children episode “Fair Exchange” (1989) as a French girl, Jovovich gained notoriety following her appearance in the 1991 romance film Return to the Blue Lagoon. In 1992 and 1993, she appeared as Christian Slater’s character’s love interest in Kuffs and as one of the teenagers in the comedy coming-of-age film Dazed and Confused. The Fifth Element is a 1997 English-language French science fiction film directed, co-written, and based on a story by Luc Besson. The film stars Bruce Willis, Gary Oldman, and Milla Jovovich. Mostly set during the twenty-third century, the film’s central plot involves the survival of planet Earth, which becomes the duty of Korben Dallas (Willis), a taxicab driver and former special forces Major, when a young woman (Jovovich) falls into his taxicab. Upon learning about her significance, Dallas must join efforts with the girl to recover four mystical stones essential to defending Earth from an impending attack. Besson started writing the story that would become The Fifth Element when he was 16 years old; he was 38 when the film opened in cinemas. Comic book writers Jean Giraud and Jean-Claude Mézières were hired for the films production design, and costume design was done by Jean-Paul Gaultier. The Fifth Element received mainly positive reviews, though it tended to polarize critics. It has been called both the best and worst summer blockbuster of all time. The film was a financial success, earning over$263 million at the box office on a $90 million budget. It was the most expensive European film ever made at the time of its release, and remained the most financially successful French film until the release of The Intouchables in 2011. Resident Evil: Retribution is a 2012 science fiction action film written and directed by Paul W. S. Anderson. It is the fifth installment in the Resident Evil film series, very loosely based on the Capcom survival horror video game series Resident Evil, and the third to be written and directed by Anderson after the first film and the previous installment. Retribution is a direct follow-on from the previous film Resident Evil: Afterlife, and focuses on Alice (Milla Jovovich) captured by the Umbrella Corporation, forcing her to make her escape from an underwater base in the Arctic Circle, used for testing the T-virus. The film has many returning actors and characters, along with new characters from the video game not featured in the previous films. Filming took place from October to December 2011 for a scheduled release date of September 14, 2012.The film was released in 2D, 3D and IMAX 3D to a box-office success, grossing over $240 million worldwide. Film critics criticized the film for its characters, plot, and acting while praising the 3D, visual effects, and fight choreography. The Blu-ray and DVD for the film was released on December 21, 2012, and a sixth installment is planned by Sony. Resident Evil is a science fiction film series based upon the Capcom video games of the same name. Constantin Film bought rights to the first film in January 1997 with Alan B. McElroy and George A. Romero as potential writers. In 2001 Sony acquired distribution rights to the film and hired Paul W. S. Anderson as writer and director for Resident Evil (2002). He continued on as writer and producer for Resident Evil: Apocalypse (2004) and Resident Evil: Extinction (2007), and returned as director for a fourth installment, Resident Evil: Afterlife (2010) and the fifth film Resident Evil: Retribution (2012), in 3D. A sixth installment is currently planned for a 2014 release date. The Umbrella Corporation acts as the main antagonist in the series, a bioengineering pharmaceutical company responsible for the zombie apocalypse as a result of creating the T-virus. 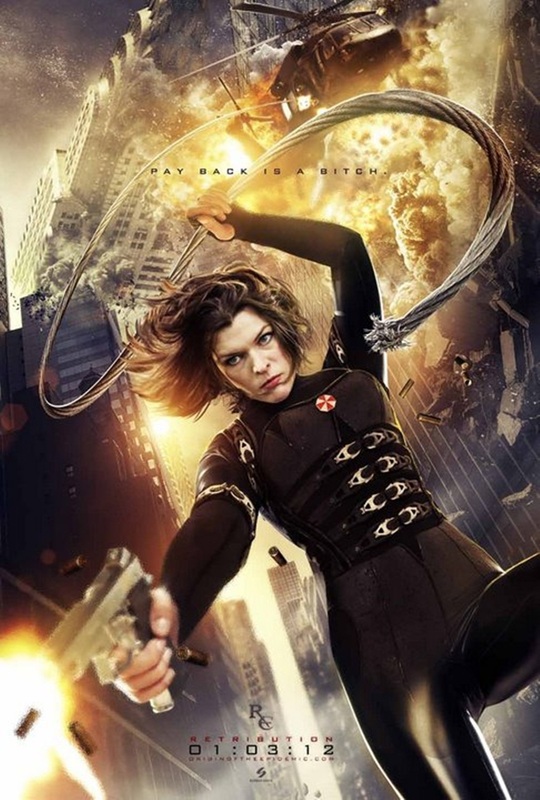 The films follow franchise protagonist Alice, a completely original character created for the films portrayed by Milla Jovovich, who was once a security operative working for Umbrella and is now the ultimate enemy of the corporation. Through her battle with Umbrella, she eventually meets with the main antagonist, Chairman Albert Wesker (Shawn Roberts). A number of video game characters also make an appearance in the films, including Jill Valentine (Sienna Guillory), Carlos Olivera (Oded Fehr), Claire Redfield (Ali Larter), Chris Redfield (Wentworth Miller), Leon S. Kennedy (Johann Urb) and Ada Wong (Li Bingbing). Despite a mixed reaction from film critics, the franchise has collectively brought in US $915 million worldwide on a $248 million budget and is the most successful film series to be based on video games, and making “Milla Jovovich” the Reigning Queen of Sci-Fi here at Movies Models and Music Magazine.